The First Amendment: What's Fair in a Free Country? Young people have a profound sense of the importance of fairness. "It's not fair" is often used as a one-size-fits-all argument when a child feels victimized. In situations where the child has an interest in protecting his or her actions, "It's a free country!" is often the argument of choice. On the other hand, children are very sensitive about speech and policies they consider to have a negative effect on their well-being. Almost every day on the playground, the difficult issues surrounding our right to free speech and our responsibility to avoid harming someone else with our speech are debated with as much emotion — if not as much impact — as they have been in the courts, legislatures, and meeting halls of this land. Balancing rights and responsibilities is difficult, even for the Supreme Court. This lesson demonstrates to students that freedom of speech is an ongoing process. How does the right to free speech conflict with our responsibility to consider the rights of others? How is the First Amendment interpreted differently in different contexts? Under what conditions is some speech limited and other speech protected? Give examples of speech that is protected by the Constitution and speech that is not protected by the Constitution. Obtain background information about the First Amendment. A student-friendly source of information is Ben's Guide to U.S. Government for Kids, a link from the EDSITEment resource Internet Public Library. Familiarize yourself with each lesson plan. Download and duplicate as necessary the case studies in Activity 4 and Activity 5. As you lead discussions in this lesson, use the terminology you want students to understand. For example, talk about speech that may be "limited" and speech that is "protected." The Educator Resources section of the National Archives website offers a series of worksheets for analyzing primary source documents, including written documents and photographs, that you may wish to use or adapt to help students in reviewing the materials presented in this unit. Cases on the docket of the Supreme Court, as well as past cases, can be studied using the EDSITEment resource Oyez. The site allows searches by subject, title, citation, and date. With each case is a very brief abstract that summarizes the basic issues. Encourage discussion about the book you choose. What behaviors among the characters are in conflict? Is it clear who's right and who's wrong? Tell the students that one important goal for this unit is that they work out some ground rules to improve the atmosphere on the playground. Activity 2. Banning Speech on the Playground? Discuss problems on the school playground. (If more appropriate substitute a discussion of problems that occur in the school cafeteria or hallways, at bus stops or other locations where students gather.) What sorts of problems are occurring out there? (Note to the teacher: It is important here that students focus on the rules and abstract principles; they should not use specific names or situations, which might turn the lesson into a "tattle-tale" session.) Brainstorm suggestions that might make recess more pleasant and that would discourage problem behavior. Remember, this is brainstorming. Accept all appropriate answers. If issues of speech arise, continue the conversation by posing a hypothetical question, such as, "Should a student be forbidden from telling another student that his/her hat is ugly?" In the course of the discussion, act as devil's advocate. Is it okay to say the hat is ugly to protect your friend from teasing? Is it okay to say the hat is ugly if the speaker has been hurt in the past by something the hat-wearer said? Is it wrong only if you're trying to hurt the feelings of the hat-wearer? How would you know the person was being hurtful on purpose? Do speakers have the responsibility to keep their opinions to themselves or the right to speak their minds? Is it the hat-wearer's responsibility not to be hurt by such criticism? Is it more important to have the freedom to say whatever you want or to protect others by being careful about what you say? Give students time to write down their suggestions for ground rules about speech on the playground. This could be worked on individually or in small groups. Challenge students to limit their statements to 45 words (the length of the First Amendment) or less. Undoubtedly, some of the brainstormed suggestions in Activity 2 represented an attempt to limit speech (e.g., "You're not allowed to..."). Spend some time reviewing the various clauses and sections of the First Amendment before moving on. The Bill of Rights states there can be no law "abridging the freedom of speech." The wording seems to suggest that all speech is protected from rules Congress might pass. Does that mean anyone can say anything at any time? The Constitution also guarantees to "establish justice, insure domestic tranquility, provide for the common defense, promote the general welfare, and secure the blessings of liberty to ourselves and our posterity." What if what one person wants to say disturbs the general welfare or someone else's tranquility? That conflict, the center of most free speech issues, will be explored in the remainder of this unit. Activity 4. Can You Say That? As you begin this lesson, remind the class that for a case to reach the Supreme Court there must be such good arguments on both sides that questions remain even after the decisions of lower courts have been made. It's the job of the students to figure out what arguments may have been used on both sides of this case. Then students will be asked to take a stand and to reveal what they think the Supreme Court decided. After everyone has taken a stand, reveal the actual outcome of the case. The Spectrum, the school-sponsored newspaper of Hazelwood East High School, was written and edited by students. In May 1983, Robert E. Reynolds, the school principal, received the pages ... for the May 13 issue. Reynolds found two of the articles in the issue to be inappropriate, and ordered that the pages on which the articles appeared be withheld from publication. Cathy Kuhlmeier and two other former Hazelwood East students brought the case to court. 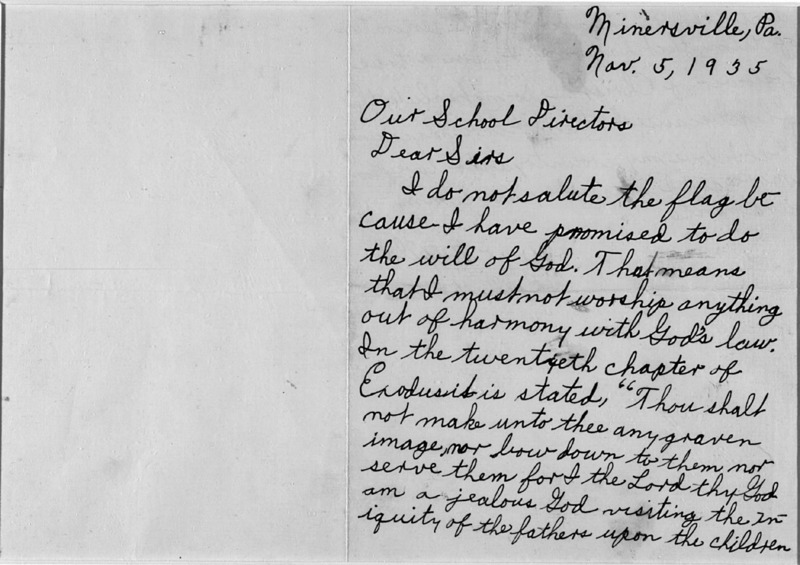 The principal objected to the divorce article because the page proofs he was furnished identified by name (deleted by the teacher from the final version) a student who complained of her father's conduct, and the principal believed that the student's parents should have been given an opportunity to respond to the remarks or to consent to their publication. Believing that there was no time to make necessary changes in the articles if the paper was to be issued before the end of the school year, the principal directed that the pages on which they appeared be withheld from publication even though other, unobjectionable articles were included on such pages. Did the principal's deletion of the articles violate the students' rights under the First Amendment? Help the class make two separate lists, showing arguments they think may have been made on either side of the case. Some points to consider: What rights (if any) should students have to publish what they wrote in the student newspaper? Should there be a school policy against certain student writings? Why shouldn't the principal have been allowed to cancel that page in the student newspaper? Why should he have been allowed? Is it fair that some articles got cut from the newspaper, even though they had nothing to so with the case? Is it fair that the divorce article could be cut even though the students were reporting facts? Does it make a difference that the students were not trying to hurt anyone's feelings? Would it be fair to the parents involved to have their story printed in the school newspaper? Then, using a secret ballot, have students vote which side they think won the case. Give volunteers the opportunity to explain why they voted as they did. In a 5-to-3 decision, the Court held that the First Amendment did not require schools to affirmatively promote particular types of student speech. The Court held that schools must be able to set high standards for student speech disseminated under their auspices, and that schools retained the right to refuse to sponsor speech that was "inconsistent with 'the shared values of a civilized social order.'" Educators did not offend the First Amendment by exercising editorial control over the content of student speech so long as their actions were "reasonably related to legitimate pedagogical concerns." The actions of Principal Reynolds, the Court held, met this test. So not all speech is protected; the school can refuse to sponsor offensive speech and any speech for legitimate educational reasons. Encourage discussion of the decision. Activity 5. Can You Not Say That? In this lesson the class will consider two related cases, the Gobitis case and the Barnette case, each involving a compulsory flag salute in school. The decision in the Barnette case superceded the Gobitis decision. In the end, the Supreme Court limited the power of the school and supported a student's right to refuse. Minersville School District v. Gobitis was decided on June 3, 1940. The question the court had to answer was, "Does the mandatory flag salute in the Minersville School District infringe on liberties protected by the First and Fourteenth Amendments?" Share with the class the information in this abstract of the case from the EDSITEment resource Oyez. Lillian and William Gobitis were expelled from the public schools of Minersville, Pennsylvania, for refusing to salute the flag as part of a daily school exercise. The Gobitis children were Jehovah's Witnesses; they believed that such a gesture of respect for the flag was forbidden by Biblical commands. Share the letter written by 10-year-old Billy Gobitis to the Minersville School Directors, which explains the case (a digital copy of Billy Gobitis' letter to the school board is available through the EDSITEment-reviewed website American Memory). In an 8-to-1 decision, the Court declined to make itself "the school board for the country" and upheld the mandatory flag salute. The Court held that the state's interest in "national cohesion" was "inferior to none in the hierarchy of legal values" and that national unity was "the basis of national security." The flag, the Court found, was an important symbol of national unity and could be a part of legislative initiatives designed "to promote in the minds of children who attend the common schools an attachment to the institutions of their country." Discuss the outcome of the case with the class. Now, have students look at another Supreme Court cases involving children, West Virginia State Board of Ed. v. Barnette, decided on June 14, 1943. The question before the court in that case was, "Did the compulsory flag-salute for public schoolchildren violate the First Amendment?" Share the information from the abstract of the case available on the EDSITEment resource Oyez. The West Virginia Board of Education required that the flag salute be part of the program of activities in all public schools. All teachers and pupils were required to honor the flag; refusal to salute was treated as "insubordination" and was punishable by expulsion and charges of delinquency. In a 6-to-3 decision, the Court overruled its decision in Minersville School District v. Gobitis and held that compelling public schoolchildren to salute the flag was unconstitutional. The Court found that such a salute was a form of utterance and was a means of communicating ideas. "Compulsory unification of opinion," the Court held, was doomed to failure and was antithetical to First Amendment values. Writing for the majority, Justice Jackson argued that "[i]f there is any fixed star in our constitutional constellation, it is that no official, high or petty, can prescribe what shall be orthodox in politics, nationalism, religion, or other matters of opinion or force citizens to confess by word or act their faith therein." Discuss the outcome. Notice, once again, that three judges disagreed with the majority opinion. Interpretations of the Bill of Rights frequently change. And that's the point. James Madison, a strong supporter of the Bill of Rights, declared that no government can be perfect, and "that which is the least imperfect is therefore the best government." What did he mean? What's the use of a document so open to interpretation? In this unit, the students have looked at speech not intended to harm anyone (the student newspaper) that was not protected. They have also read about a student whose refusal to say the Pledge of Allegiance was protected. Culminate the lesson by returning to the opening discussion. Would the class proceed now with banning certain speech on the playground, or are there alternative solutions? In small groups, students should write their proposals for dealing with playground problems. Solutions can involve any or all of the following: rules, suggestions for dealing with teasing, ideas for consequences, systems for mediation between those involved, reorganization concepts for the playground such as new activities or ways to organize activities, and so on. What can you come up with that's as fair as possible? These suggestions should be shared with the class. Once again, attempt to keep proposals under 45 words. Perhaps some student suggestions can be formally adopted. If desired, the class can work with the various group suggestions and attempt to synthesize them into one set of procedures for the playground. Set up a role-playing situation to test the students' suggestions or the entire system designed by the students at the culmination of the unit. Pose a problem. For example, let's say "Billy" told "Michael" he couldn't play in the touch football game he was organizing. According to the system designed by the class in Activity 6, can he do that? What if Michael still believes it's unfair despite the rules? Students can play the parts of Billy and Michael, as well as their legal team. Stage a "replay" of the incident in class. Some students will then be witnesses. Let a few students testify as experts. Appoint an odd number of judges to decide the case. Make sure the student lawyers are aware of sound arguments on both sides of the issue. The final decision must reflect only whether or not the system designed by the students is fair, as opposed to whether or not what Billy did is "nice." If the law is "constitutional" and it allowed such behavior, then that behavior is deemed acceptable even if it isn't fair. Some students may appreciate studying the Supreme Court case Brandenburg v. Ohio (1969), involving hate speech that was deemed protected. In this case, a Ku Klux Klan leader requested to be videotaped by a local television station as he gave a speech to his supporters in which he said many terrible things about various people. Ohio had previously passed a state law that made it illegal to deliver a speech recommending "crime, sabotage, violence, or unlawful methods of terrorism as a means of accomplishing" change in our government. The law also said it was illegal to gather "with any ... group ... formed to teach ... the doctrines of criminal syndicalism." The question to be decided in the case was, is such a law constitutional? Did Ohio's law violate Mr. Brandenburg's right to free speech as protected by the First (and Fourteenth) Amendment? Then, using a secret ballot, have students vote which side they think the Supreme Court judged to be correct. If the law was constitutional, then Mr. Brandenburg had no right to say what he said. If the law was unconstitutional, then he had the right to say what he said. Was the law constitutional? If desired, give students the opportunity to explain why they voted as they did and/or to discuss the issues of the case. Students who studied Hazelwood School District v. Kuhlmeier should discuss whether it is fair that the right of the KKK to disseminate racist speech was upheld, while the free speech of well-intentioned students was curtailed! Students may be interested in the Bill of Rights and its origins. A kid-friendly source of information is Ben's Guide to U.S. Government for Kids, which includes this page on the Bill of Rights. Students may be interested in writing protest letters as Billy Gobitis did. For more information, see the EDSITEment lesson I'm Gonna Sit Right Down and Write Someone a Letter. Students may be interested in researching the Civil Rights Movement, during which participants were largely protesting laws on the books at the time. Some EDSITEment resources with relevant information include We Shall Overcome: Historic Places of the Civil Rights Movement and Martin Luther King, Jr.